Should Prisoners Be Entitled to Free College from State or Federal Funding? Home > NewsRelease > Should Prisoners Be Entitled to Free College from State or Federal Funding? Should prisoners be entitled to free college? Does this really make sense? Paul Brakke, the author of Crime in America and seven other books published by American Leadership Books raises these questions and says firmly "No!" As Brakke explains, a growing numbers of states are setting up such programs where the state partners with a prison, as described in a recent article "State partnering colleges with prisons. U.S. experiment studies learning's effect on inmates," which was published in a recent Arkansas Democrat Gazette article by Stephen Simpson. The article describes a program at Shorter College in North Little Rock which instructs inmates from the Arkansas Department of Corrections at Wrightsville. After two years, these convicts receive an Associate of Arts degree, as they might at a junior college. But even while Governor Hutchinson and Senator Boozman from Arkansas attended a graduation ceremony and were very enthusiastic about the program, Brakke feels such a program is overly expensive and not appropriate for government funding. Moreover, he points out that most prison inmates are poorly educated, some even illiterate, and according to recent national statistics, about 70% lack high school degrees. Thus, a program to provide a high school diploma or GED makes much more sense. In fact, GED instruction is required in state prisons in Arkansas. In a chapter in a forthcoming book, A Compendium of Comments on Fixing What's Wrong with the Criminal Justice System, Brakke points out what's wrong with such a program. "First," Brakke says, "the big problem with state or federal funding for criminals in college is that those places could be taken by other students who would be paying tuition. Why should criminals get a break and obtain a free college education unavailable to law-abiding citizens? Moreover, very few prisoners qualify for such a program, since the vast majority of prisoners are poorly educated and some are nearly illiterate. Therefore, getting a high school diploma or its GED equivalent makes much more sense, since this would help ex-cons get jobs upon release, and all citizens are entitled to a free public education through high school." But a college education normally requires a paid tuition. Accordingly, Brakke feels such college education programs shouldn't be provided for prisoners by the state or U.S. government, since the U.S. already has a nationwide college loan debt crisis. Accordingly, in his view, any funds for education should go to ameliorate that debt, not provide these funds for criminals in prison. A related reason Brakke cites for not funding these college-for-prisoner programs is that colleges should work on increasing their own graduation rates, not offering programs to prison inmates. For example, Shorter College, cited in the article is an African American private two year junior college with a graduation rate of only 9% within three years. 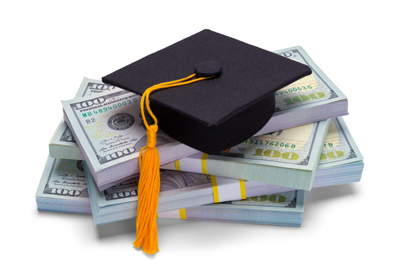 Unfortunately, most of the 90% of the students who don't graduate within 3 years will be stuck with a student loan debt for the rest of their lives -- at an average cost of about $18,000 for three years for tuition, fees, books, and supplies -- and all for nothing. While most other universities don't have such a high drop-out rate, many other colleges and universities, whether state or private, have graduation rates in the 20 to 30% range. That means that 70 to 80% of their students without degrees still ended up with high student loans they have to pay off at exorbitantly high interest rates. They can't even discharge these loans in a bankruptcy. So this is another crisis better addressed by state and federal funds than investing in college for criminals. Additionally, Brakke feels that many colleges with low graduation rates should be closed, even if they are the only higher education institutions that serve their rural communities. Finally, Brakke suggests that the low unemployment rate all over the nation is one more reason why funding college tuition for prison inmates is not the way to go. Because of this low employment rate, employers are already having a hard time filling their positions, so the need for a college degree for a small number of ex-felons is minimal. Rather, any funding should go for helping these employers find employees, perhaps by providing funds to train recently released ex-cons with high school diplomas or GEDs on how to find jobs, because that will add more prospective employees to the jobs pool. Additionally, some funds might be provided for jobs training, so the ex-cons can work in the fields where employers need employees. In writing his books, which include Crime in America and the soon to-be-released A Compendium of Comments on Fixing What's Wrong with the Criminal Justice System, and working as a consultant, Brakke brings to the table a unique conservative approach to crime and criminal justice. That's because usually liberals discuss ways to reform the system through more of a social welfare approach. But Brakke's approach is based on an economic business model of doing what works most efficiently to both cut down costs and create more productive citizens. To learn more, you can get a copy of Crime in America, which is now available through Amazon, Kindle, and major bookstores. It is currently available on Kindle at reduced price during its special KDP Select Promotion at https://www.amazon.com/Crime-America-Conservatives-Approaches-Criminals-ebook/dp/B07MKZG84Z. Also, free copies are available for government officials who are seeking ways to reduce crime and fix the criminal justice system and for members of the media at www.crimeinamericathebook.com. Fractured America will be published in early February.